Wow! What Have I Started? Little Rock boiled. The situation was so acute that the mayor, abandoned by the governor and the Arkansas National Guard, requested help from the federal government, which was something Southern states just didn’t do. Throughout September 1957, nine black students had tried to enter and integrate Central High School. White mobs harassed and threatened them. There were beatings, bomb threats, burned crosses and shotgun blasts, including one that blew out a window in the home of Daisy Bates, then president of the Little Rock chapter of the National Association for the Advancement of Colored People (NAACP). As days passed, tension mounted until the scene in front of the school deteriorated into chaos and panic. The tension peaked on Monday, Sept. 23, after police quietly escorted the students into the school. Outside, white protestors confronted a line of policemen, who were heavily outnumbered. A riot seemed certain until the black students were removed from the school. The next day, in response to the mayor’s appeal, President Dwight D. Eisenhower federalized the Arkansas National Guard and sent units of the U.S. Army’s 101st Airborne Division to Little Rock to restore order, enforce federal law and protect the students’ right to attend Central High. Wiley Branton heard the news on his car radio. “Wow!” he said to himself. “What have I started?” Years later, Branton said he never felt so proud of his country. The University of Arkansas Press published Kilpatrick’s biography of Wiley Branton this fall. In addition to the shock, there was also pride, joy and satisfaction, although Branton, a tireless and dogged civil rights advocate — “warrior,” as the book title says, is probably more appropriate — did not pause to revel in his success. Throughout Kilpatrick’s book, the reader senses that Branton was never content when it came to civil rights, voting rights and equal opportunity for African Americans. There was always a sense of urgency about the next challenge. For Branton, the Little Rock Crisis began on Feb. 8, 1956, a full year and half before the nine students tried to enter Central High. On that date, he sued the Little Rock School District on behalf of 33 African American students who were not allowed to register at white schools. The action came almost two years after the U.S. Supreme Court’s landmark decision in Brown v. Board of Education, which ruled that segregation in American public schools was unconstitutional. Although the Brown decision did not give school districts much direction on how to integrate or, perhaps more importantly, how fast to integrate, the Little Rock district had had two years to do something. There had been little progress, and the black community was tired of waiting. For 18 months, leading up to the start of the 1957-58 school year, Branton, with the help of Thurgood Marshall and other lawyers of the national NAACP, had shepherded the suit, titled Aaron v. Cooper, through the U.S. District Court in Fort Smith and Eighth Circuit Court of Appeals in St. Louis. 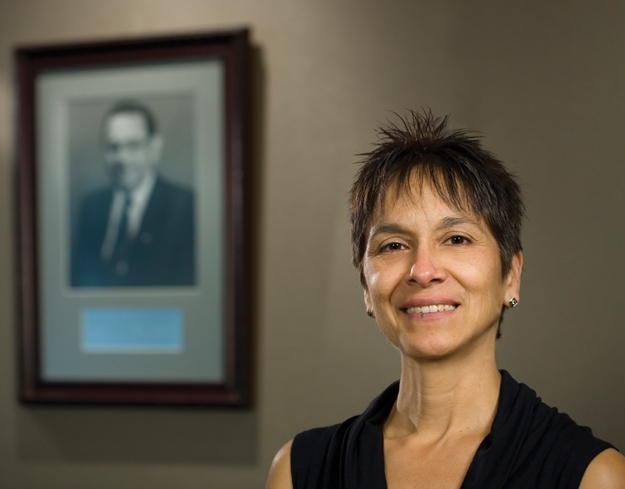 UA Law Professor Judith Kilpatrick began working on a biography of Wiley Branton after Branton’s name was barely mentioned at events commemorating the 40th anniversary of the Little Rock Crisis. Serendipity led Kilpatrick to Wiley Branton. Almost 10 years ago, a friend who worked at the University of Arkansas Press called Kilpatrick and asked if there was anyone in the law school doing research on civil rights. If so, would that person consider writing something about Wiley Branton? The impetus for the call was a letter published in the Arkansas Democrat-Gazette following events commemorating the 40th anniversary of the integration of Central High School. The letter, written by Stephanie Branton, Wiley Branton’s daughter-in-law, commented that the program barely mentioned her father-in-law, which she thought was unfortunate. (Incidentally, the only speaker to speak about Branton was someone not from Arkansas — Thurgood Marshall Jr., son of the famed civil rights lawyer.) In Fayetteville, Kilpatrick’s friend read the letter and agreed. Kilpatrick said there wasn’t anyone in the law school doing that kind of research, but she thought it sounded interesting. Kilpatrick wrote letters to Branton’s children and siblings to inform them of her desire to write Branton’s biography. Family members eventually gave their blessing, and over the past seven years, the parties have become close friends. Through the process of learning more about Wiley Branton, Kilpatrick, who is also an associate dean at the law school, wondered what made him think he could become a lawyer in 1950, an era in which professional opportunities for African Americans were severely limited. Obstacles, both physical and psychological, pervaded American society, especially in the South. Kilpatrick discovered that Branton came from a strong, mostly prosperous family with several members who were committed to improving conditions for African Americans. He also grew up in a large African American community in Pine Bluff. These factors influenced his commitment to civil rights and social issues, but they did not answer the question of why he had decided to become a lawyer. Did Branton have any role models? This simple question led Kilpatrick to related, albeit tangential, research on the history of black lawyers in Arkansas. From this side project, she created the Black Arkansas Lawyers Web site, http://www.arkansasblacklawyers.com/, which features information about Branton and approximately 100 black men who had been admitted to practice law in Arkansas before 1950. The purpose of the site is to provide information and encourage contributions from the public about Arkansas’ early black lawyers. In many ways, Wiley Branton’s story epitomizes the generation of young men and women who survived the Depression, saved America in World War II and came home to accomplish great things such as write epic novels, discover penicillin and engineer and construct America’s interstate highway system. Those who weren’t permanently injured or deeply traumatized by the war felt more than relief. It was catharsis, a state of mind and spirit that gave them a sense that nothing was impossible. Psychologically, the war was especially painful for African Americans, not because they experienced more carnage than whites but because they fought and died for a country that did not value or protect racial equality. Black soldiers suffered humiliation in segregated units and were subjected to racist incidents both within the armed services and in communities where their units were based. Before the war, there had been some progress on civil rights, mainly in court cases in which NAACP lawyers sought to force integration at the graduate- or professional-school level. For the most part, African Americans put this progress on hold to support the war effort. Because of these issues — the war experience and delayed progress on civil rights — African Americans felt a heightened sense of urgency about social change after the war. 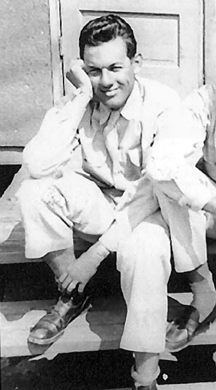 Branton served in the U.S. Army during World War II. Wiley Branton fit firmly in this camp. His war experience was relatively benign, but he knew about racist incidents and other hardships experienced by black soldiers because he read many African American newspapers and magazines. Already imbued with an activist spirit, he returned to Pine Bluff with an even greater conviction and commitment to do something to effect change. After the war, Branton took over his father’s taxi-cab business and participated in various civil rights activities, including local voter-education projects. He joined the Pine Bluff chapter of the NAACP. 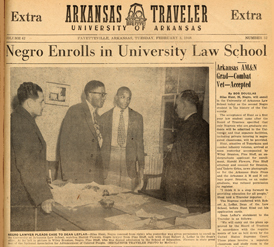 In 1947, he convinced Silas Hunt, his friend and former classmate at Arkansas Agricultural, Mechanical and Normal College (AM&N), which is now the University of Arkansas Pine Bluff, to apply to the University of Arkansas School of Law. At that time, the law school had never accepted black students. Reluctant at first, Hunt finally agreed, and Branton supported his friend by accompanying him to Fayetteville on Feb. 2, 1948. On that day, Hunt registered for classes and was admitted as the university’s first black student in modern times. (A few black students are known to have attended university classes soon after the school was founded in 1871.) On the same day, Branton applied for admission as an undergraduate student. His application was rejected. Branton returned home, ran the taxi-cab business and finished the necessary college units at Arkansas AM&N for admission to the UA law school. The experience with Hunt and his participation in the integration of the university further cemented Branton’s intention to become a lawyer. Two years later, married and the father of three children, Branton returned to Fayetteville and entered law school. He became the school’s third African American graduate and today is honored as one of the Six Pioneers, a reference to Hunt, who died before finishing law school, and the first five African American post-war, law-school graduates. Branton (far left) accompanied his friend Silas Hunt (second from right) when the latter was admitted to the University of Arkansas in 1948. Kilpatrick discovered that when Branton finished law school and started his practice in Pine Bluff, there were fewer than 10 black lawyers in Arkansas. This unfortunate reality ensured Branton would have plenty of work. He accepted and successfully handled several civil rights cases, including one in which he was appointed a special assistant prosecutor and helped win a conviction against a white man who was accused of sexually assaulting a 7-year-old black girl. By the time the Little Rock chapter of the NAACP hired him to file and pursue Aaron v. Cooper — only three years out of law school — Branton had built a reputation as a more than capable trial lawyer who was not afraid of tough cases. His professional abilities, combined with his commitment to civil rights issues, made him the perfect candidate to challenge the Little Rock School District. Many, if not all, African Americans in Little Rock suffered during the month of September 1957. But, as Judith Kilpatrick explains in her biography of the attorney who represented the Little Rock Nine, that month was especially harsh on Wiley Branton and his family. In court virtually every day and working late into the night, he and Thurgood Marshall sometimes bunked in the home of Daisy Bates, then president of the Little Rock chapter of the National Association for the Advancement of Colored People. One of the men had to sleep near a window that had been blasted by a shotgun. Down in Pine Bluff, Branton’s wife Lucille was anxious and feared for her husband’s safety, which likely contributed to her going into early labor and giving birth prematurely to Debra, the couple’s sixth and youngest child. Embroiled in daily and sometimes hourly legal maneuverings related to the crisis, Branton could not make it home to Pine Bluff when his wife re-turned home from the hospital. As Lucille approached the home with her newborn baby, she discovered a burned cross on the front lawn. 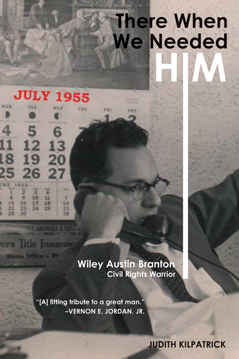 Even after the Little Rock Crisis abated, Aaron v. Cooper dominated Wiley Branton’s professional life. Just as he had done for more than a year before Eisenhower sent federal troops to Little Rock, Branton doggedly — some might say obsessively or maniacally had he not been so thoroughly prepared, humble and courteous in manner, convincing in his arguments and profoundly sure of the critical importance of his work — pursued the case through all levels of federal courts, including the U.S. Supreme Court. His energy and commitment to the case persisted even after the case had lost its intensity. he personally delivered it to the appellate court in St. Louis. When a clerk there would not accept the transcript because it was not a certified copy, Branton immediately flew to Washington, D.C., where a Supreme Court clerk refused to accept the record without formal certification from one of the lower courts. For most of 1957 and 1958, Branton and Thurgood Marshall fought to preserve the progress they had made to integrate Little Rock public schools. They succeeded with the case but could not stop Gov. Orval Faubus from closing all public high schools in the city. On Sept. 12, 1958, the court ruled that the Little Rock School District had to continue with its integration plan. Faubus immediately ordered the schools closed. Later, a federal court of appeals issued a temporary restraining order forbidding any property transfer by the school board to prevent the district from hiring a private company to operate its schools, which the governor had sought as a means to avoid integration. Little Rock public high schools reopened for the 1959-1960 school year. Despite several important and seemingly final decisions, Aaron v. Cooper was reactivated many times over many years, long after Branton transferred primary responsibility of the case to another attorney. The Little Rock Crisis was only part of Wiley Branton’s remarkable life. Although it dominated his career for many years and was his most important case, Aaron v. Cooper, at least the first six years of it, may be viewed as a point of departure for a rich and varied life of public service. In fact, while reading Kilpatrick’s book and pondering its subject’s career, it is difficult to fathom everything Wiley Branton accomplished. In addition to participating in the integration of the University of Arkansas and serving as the principal attorney in the most important public-school integration case other than Brown, Branton directed the Voter Education Project, the largest voter-registration effort in U.S. history, and, as a member of President Lyndon Johnson’s administration, helped coordinate the federal government’s civil rights efforts following enactment of the Civil Rights Act of 1964. He also worked for the U.S. Department of Justice, participated in the landmark case that led to deregulation of the telecommunications industry and served as dean of Howard University’s School of Law. A theme of Kilpatrick’s book — it is invoked in the title — is that Branton was there. He was present at many major historical events, especially those in which African Americans needed him. He was ubiquitous, like the eponymous character in Zelig, the Woody Allen movie. Wiley Austin Branton died of a heart attack on Dec. 15, 1988. He was 65. The University of Arkansas Press published Kilpatrick’s biography this fall, which is the 50th anniversary of the Little Rock Crisis.